The movie has a connect and the connector is Geet. She is so full of life that after the first half, I wished that their journey from Mumbai to Bhatinda had a little more show time. There is a sweet scene in the second half where Aditya asks Geet to shed her tension wala face and make the earlier bubbly wala face, and Geet makes that for a second. The film has many such feel-good scenes. Imtiaz Ali went on to make Highway which is yet another journey involving rediscovering life. Even Tamasha which is his next is based on the theme of reinventing self. His movies have marvellous landscapes. 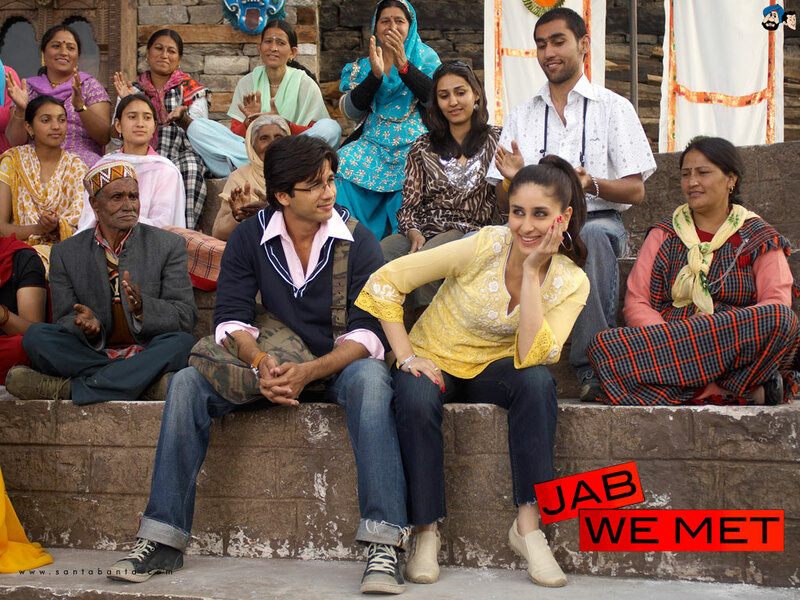 Jab We Met is set in the northern part of India. The movies are visually so beautiful with exhaustive natural aspects whether it is the scene where Geet calls Aditya to meet her in the lush green fields at five in the morning or their jeep journey to Anshuman’s place where they travel on roads sandwiched between snow clad mountains. There is a freshness in his movies which can be felt throughout. The running behind the trains scene from DDLJ is an eternal one. Jab we met has many of them because Geet has this record of never having missed any train in her life. When she chooses Anshuman over Aditya towards the film’s end, she says, ‘Aisa lag raha he ki koi train chootne wali he’ where she refers to the intuition of her life decision going wrong. The Punjabi family shown in the family is a true blue Punjabi family; enthusiastic and dare devil. The energy in the song Nagada Nagada is super contagious. Finally all is well in the end when Geet and Aditya marry and have kids. Just before the end credits, the four of them are talking to the Late Dara Singh where he says, ‘Arey bachho, hamare umar me waqt nahi lagta. Ek jhalak kaafi hoti he, ye jaanne ke liye ki ladke aur ladki k beech kya chal raha he’ and Aditya says ‘Jee daarji’ and the end credits roll. What a movie! Arbaaz Khan owns a brand called Dabbang and its brand ambassador is none other than the crowd entertainer - Salman Khan. It seems that whenever Arbaaz Khan will be in need of money, he will release a Dabbang :-D. The impact that Salman Khan makes on the masses could be seen by the whistles and cheers every time he made a gigantic entry. Some of his acts and stunts remind me of Rajnikant. I had decided not to watch the movie in a multiplex to experience the craze for Salman but I did not miss a percent of the thrill, the aura even in the multiplex. On a beautiful Saturday morning, it was time to board that flight to Delhi which would mark the start of a nine day full of a breath-taking experience. For me, there were many things on this trip that would be my debut; travelling through the clouds*, walking on the ice clad mountains, trekking to heights as huge as 15000 feet, seeing my own breath coming out as vapours in those cold nights and walking close to a 100 km in a 5 day span. * travelling through the clouds is an over-excited first timer’s representation of boarding a plane.